This morning I woke up early because I had a nightmare of sorts. In my “dream” I was at a place where I was to cater a brunch and deliver the food at 10:30 AM. However, when I saw the clock (in my dream) it was 12:00 noon… and none of the breakfast breads had been baked yet. Talk about a wake-up call! The only other food nightmare I’ve had involved a guest at a wedding that I was making the cake for… but I had forgotten all about it… and I had less than two hours to make a wedding cake for 100. Yikes. Let’s just say I was happy to get out of bed after that! I was supposed to go for a walk with a friend at 8AM, but the rain was coming down too hard for me… and so that was cancelled. This afternoon I was scheduled to help at the Rotary Garden, but that too was cancelled due to the weather. So, instead I caught up on my chores and made my pie of the day. 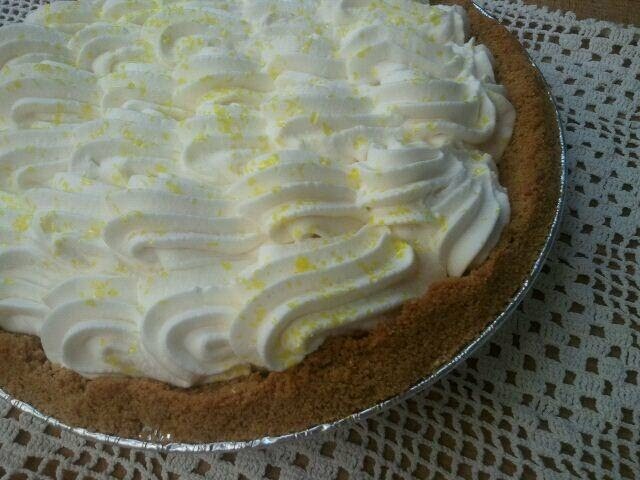 Last year I made a lemon chiffon cake for this couple… and that is why today I decided to make them a lemon curd pie. Years ago, Bob worked with my son Coco and his friend Dylan to help them record their first songs on a CD. Coco had told me that they were working together… but I was still surprised when he brought home the CD and put it on to play. As we listened to the music I asked Coco, “Who is that singing?” “Mom”, he said, “it’s me.” “No, really Coco… who is it?” And that is only because I had never heard Coco sing before! Here was this lovely voice emanating from the speakers… and it had come from the boy who lived in my house… unbelievable! Juli has been the Superintendent for the Ashland School District for nearly twelve years. She has had the unenviable task of doing all that she can to make sure that the Ashland School District is one of the top schools in the state, and possibly in the country. To achieve this, it means that Juli is always preparing for and attending meetings with people all over the state. She is relentless when it comes to the quality of education that the students in Ashland receive. To Bob and Juli, I offer my deepest thanks for their commitment and dedication to the students of Ashland. I am so very thankful for their tireless efforts on behalf of our children.